Home Star Wars Opening Night for the Georgia Swarm is Star Wars Night! Opening Night for the Georgia Swarm is Star Wars Night! (ATLANTA) – With a new CBA settled on Saturday, the Georgia Swarm’s 2018-19 Home Opener is now set for Saturday, Dec. 15. The Swarm will welcome the New England Black Wolves to Harrah’s Cherokee Casino Field at Infinite Energy Arena for a 7:05 p.m. ET faceoff. That evening, Georgia will host its fan-favorite Star Wars Night presented Peachtree Orthopedics. 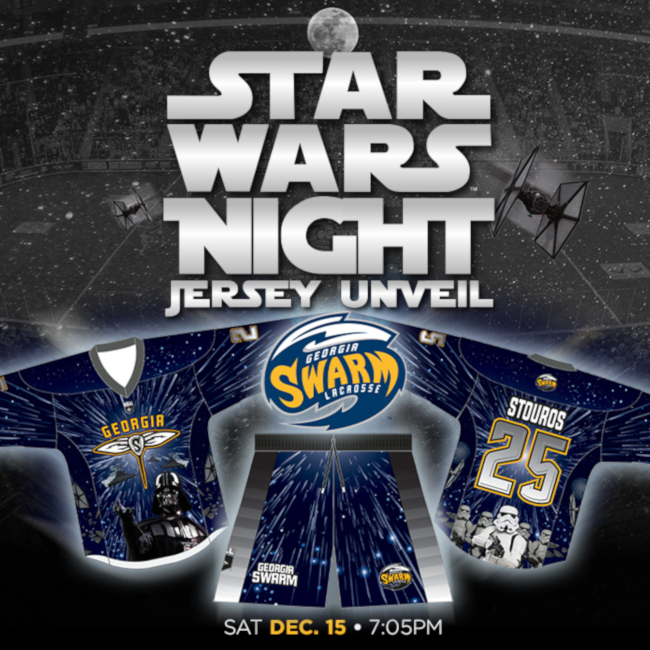 This year, Swarm players will be wearing special Star Wars-themed jerseys and shorts. Following the game, fans will have the opportunity to bid on game-used, autographed Star Wars uniforms. Select proceeds from the uniform auction will benefit the Rally Foundation. 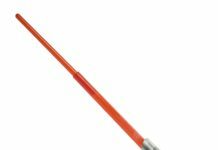 Early-arriving fans will receive light-up Bamstix and have the opportunity to mingle with several dozen Star Wars characters in the 501st Legion, Georgia Garrison throughout the game. 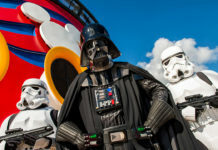 Fans can purchase tickets by visiting GeorgiaSwarm.com/StarWars or calling 844-4-GASWARM. Additionally, Georgia’s new Training Camp dates will be announced later this week. In 2017-18, the Swarm claimed its second-straight East Division Regular Season title after winning its final six games to finish the season at 11-7. Georgia ultimately fell 9-8 against the Rochester Knighthawks in the East Division Finals. Lyle Thompson once again led the team in scoring, finishing with 86 points (46G, 40A) and leading the team in loose balls (123) and caused turnovers (21) Thompson also received the NLL Sportsmanship Award and was named to the NLL All-Pro Second Team. Swarm Season Tickets start as low as $25 per game and are On Sale Now! Join #StingCity today and reserve your membership by calling 844-4-GASWARM. Next articleThe Next Five Episodes of Star Wars Galaxy of Adventures are Online Now!